Sculptor, Jude Martland, is determined that this year there will be no Christmas after his brother runs off with his fiancée and he is keen to avoid the family home. However, he will have to return by Twelfth Night, when the hamlet of Little Mumming hold their historic festivities and all of his family are required to attend. 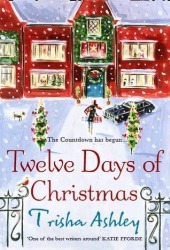 Amazon always recommends me really great books to read so when it recommended Twelve Days Of Christmas and seeing as the book had a sort of The Holiday-esque feel to it, I knew I had to download it and give it a read. The Holiday, is after all, my favourite Christmas film, so if a book channels that film into it, then I thought it must be a great read. Twelve Days of Christmas is about Holly. She’s a widower who doesn’t celebrate Christmas due to her Grandma’s Strange Baptist upbringing and the death of her husband. During the summer she is a chef and during the winter months she house-sits, so when her agency calls her up last minute about a house sitting job in the remote Lancashire moors, she takes the opportunity. All she wants is to hide away in the isolated countryside of this house and it’s the perfect excuse to forget about all the festivities of Christmas. I have to say, that it took me quite a while to get into the book. I’m not sure why, as many books I have read I am instantly attached to them and read them in a night, but with this book, it took me days. I really didn’t want to give up on reading it, mainly because of The Holiday feel to it, so I trudged on until FINALLY it became hard to put it down. I think it was because it involved way too much detail on everything that is written. To be honest, I skimmed those parts as I really didn’t care for the carpets or the rooms etc. Being so heavily committed to explaining things like that stopped me into wanting to read those parts, hence the skipping. I did eventually become drawn into the story. I liked the phone calls with Jude and Holly. They made me laugh at how infuriating they both made each other; even though they had never met and ‘never would’ because Holly would be gone before he’d arrive home. The whole family were very welcoming of Holly, treating her as one of their own, which I adored as Christmas isn’t something that Holly celebrates, but they bring it out in her and she actually feels content celebrating and being around these people when she had hid away for years during the holiday. All the characters were great to read. I loved Jess – the teenager – she was so much fun to read and Noel, he was a great character. So caring and welcoming towards Holly. I actually did really like Jude from the start – I could see he was a bit anxious about a new person looking after his house when the couple who were meant to have looked after it for years, but when he does make an appearance, he stole my heart and the bickering still continued between Holly and him, but it all just added to the story and their chemistry – which everyone could see apart from Holly. The one person who stole the book for me was Merlin, the dog. He was such a cutie, so loyal towards Holly and Jude, even though Jude is his owner, he loved being around Holly too and felt conflicted over whom to go to when they weren’t both in the same room. I don’t have a dog myself, but if I did, I would want it to be Merlin, because he’s a sweetie! At the start of each chapter is an extract from Holly’s Nan’s diary, which slips in well with the storyline and the family she is hosting for. It made sense and it was a nice addition to the book that you got to kind of see both sides to both families. I know parts of this review seem a bit critical and I have to admit, it is my first review where I have criticised the book. I never normally do because I become attached to the book instantly, but I had to say that it didn’t come until over 100 pages. I could have easily put the book down and placed it in my ‘Did Not finish’ shelve, but albeit, as much as it took a while, I did eventually get to become attached to the story in the end. I know it focuses on food a bit too much, and it did get tedious, but I would have loved to try everything Holly made as it sounded delicious. If you’re looking for a Christmas book including food and family, then this book is for you. Just because it took me a while to get into it, doesn’t mean you want become engrossed immediately. But I did enjoy it when I read more pages and it truly is a splendid book to read.